Join this 200-hour yoga teacher training course that aims to enhance your spiritual bliss through yoga, meditation, philosophy, spirituality, and Ayurveda. 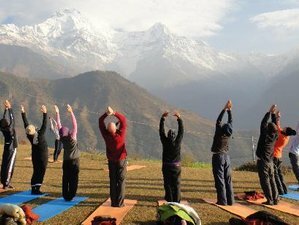 You will enjoy yoga and meditation lessons in a beautiful yoga hall and accommodation set among the lap of nature in the foothills of the Himalayas in Pokhara. This beginner's course is for learning and excelling in various forms and guidelines of yoga. It is certified by Yoga Alliance USA and the curriculum is strictly based on its guidelines. During this training, you will stay either in a shared or a single room. All modern amenities are available, yet ashram-like space is also provided. The hotel has Wi-Fi Internet service, 24 hours security, room service till late night, a safe deposit, free luggage storage, and a conference hall. This intensive 200-hour yoga teacher training program will make you not only physically strong but also will enhance your mental and spiritual contentment. On successful completion of this course, you can get yourself registered as an RYT 200-hour yoga teacher. During the weekend, you will also participate in social, cultural, and recreational activities and as well as a group discussion once a week aimed to develop your critical skills. All students are requested to be punctual based on the training timetable and to attend all yoga course programs. During Saturday and Sunday, there will be no classes. Meditation classes and shirodhara of Ayurveda will be taught only during full moon days. The results of the training program cannot be guaranteed and your progress depends on your effort during in and outside the class. Individual results vary from person to person. Known as an energetic form of yoga, Ashtanga yoga opens your tight shoulders, hamstrings, and hips. If practiced properly, the student or the practitioner will reach the peaks of all the levels of human consciousness, physical, mental, and spiritual. In this 200-hour yoga teacher training course, you will learn the basic techniques behind the postures and perform all the asanas easily. You will become masters in performing the postures, correct breathing, gazing points, and the control over energy locks involved in Ashtanga yoga. You will learn the primary series of Ashtanga yoga as per the Mysore style. Gentle and slow-paced, Hatha yoga increases strength, tones muscles, calm the mind, balance hormones, reduce stress, and cleanse and flush all the toxins from the internal system of the body. The Hatha classes safely progresses from easy to challenging poses and will make you learn it thoroughly. Hatha teaching involved in the 200-hour yoga teacher training course is suitable for all levels. While gaining the physical and mental benefits of yoga, you will learn the real meaning of yoga and the life through the yoga philosophy involved in this 200-hour yoga teacher training course. Access your whole being and achieve the self-realization while connecting with the spiritual power of yoga and meditation. You will experience the original teachings and texts of yoga tradition and improve the quality of your life. You will carry the transformative experience from your yoga mat into your daily life and be an accomplished yogi in addition to a qualified yoga teacher. In addition to these, the 200-hour yoga teacher training course will give you an opportunity to master yourself in meditation techniques, Kundalini yoga, Laughter yoga, anatomy, and physiology. Founder of Vyasa Yoga Peeth, Tuna Khatua, is one of the renowned yogis in Rishikesh who have spent their life in this field. A strong believer of Ayurveda and its form, he has been preaching and practicing the same ever since he entered this field. A child prodigy, Swami Ji was a compassionate soul since his birth. With a Ph D in Cytogenetic, he has been teaching at many pioneer institutes but his love for Kriya yoga to which he was introduced in 1994, led him to deeper aspects of this science. An author of the well proclaimed book, Kriya Yoga - The science of life force, Swami Ji teaches students of Vyasa Yoga Peeth to give initiation to Kriya yoga. Due to his immense busy schedule, it is advised that his presence be confirmed before arriving. Yogendra Mishra, commonly known as Yogiji, is a very experienced yoga and meditation master. He is mostly teaching in America, Germany, Russia, Japan, and Canada. Yogiji has been a yoga teacher for more than 36 years. He has also taken part in several yoga research projects determining the association of mental-physical well being and yoga. Drinking from various ports, Manual Fernandes is not just a Ph D in the field but a Lama too. Living and working at Tibetan Buddhist meditation retreats (Drikung Kagyu order) in Pithoragarh and Almora, Kumaon Himalayas, he has learned spiritual ways like no other. After completing his retreat and learning process, he kept the ball rolling as he started to help them in their next retreat. This teacher training will take place at the Hotel Asia in Pokhara, Nepal. Hotel Asia is located near Phewa Lake, providing a soothing ambiance that imbibes a mystical aura giving a boost to your spirituality and mental rejuvenation. Practicing yoga in such an environment will let you understand the beauty of yoga and heal your body and mind thoroughly. During this teacher training, you will be served three daily delicious meals per day. The food is 100% vegetarian, following the balance of body and mind. The time for food is fixed as per timetable thus promoting control among students. The meals are hygienic and delicious. During your free time, you may enjoy adventurous activities like paragliding, boating at Fewa Lake, trekking, or visit ancient temples like the World Peace Pagoda. Please book you flight to arrive at Pokhara Airport (PKR). Vyasa Yoga Peeth will pick you up from the airport. The pick-up is included in the price. Vyasa Yoga Peeth is a Yoga Alliance registered international yoga school in Rishikesh, the capital city of yoga in India.